I started working on a new game recently, you can see the progress here on GitHub. The game is kind of like Minesweeper, but with Hexes instead of squares. The rules of the game are pretty simple, find all the goals before you run out of energy. If you run out of energy before finding all the goals, you lose. Every time you find an energy that is usable to search more for the remaining goals. Every time you move, you lose a little energy. If you select a hex that is a danger, you lose a large amount of energy. Each hex that you reveal gives you two pieces of information. The straight line distance to the closest hidden danger and the straight line distance to the closest hidden energy. These distances are updated as you reveal the danger and energy squares, so they are always accurate to the closest hidden danger or energy. Players click a hex to reveal that hex. They can click any hex at the start of the game. Once the first move is complete, they can only choose a hex that is adjacent to a revealed hex. They are displayed in a darker color currently to indicate that they can be clicked. The player continues to click to reveal more squares and get more options to reveal until they have won or lost. The energy is shown at the top, and also serves as the game score. Players are incentivized by the score to make as few moves as possible, and that is reinforced by the loss condition. Winning in as few of moves as possible makes the gameplay fun. 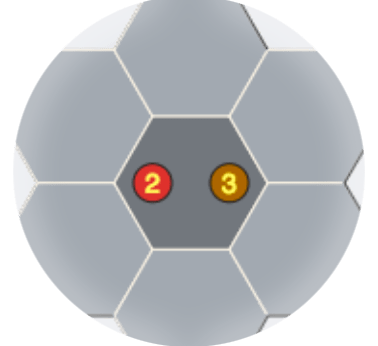 Currently, the game board is a fixed size, so there is no ramping up the player from easier to play versions of the game to more complex. The original minesweeper had at least a few options, easy/medium/hard/crazy hard. With only one simple board Hex Game is only one dimensional. Graphics need some help and without any animations, it does not feel very game-like yet. But the biggest issue is that your first click can cause you to lose if you click a danger. Bad luck certainly, but no fun. Also, game boards may be unwinnable, depending on your first click and your luck. My plan is to address these issues in the next few weeks.